SDT and Lavanya graced the pre-release function of Intelligent. And, not surprisingly, they grabbed plenty of attention. 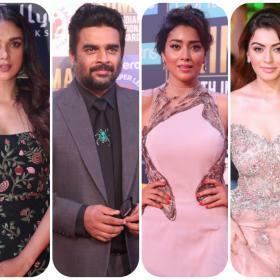 There can be no denying that 2017 was a year of mixed fortunes for young actor Sai Dharam Tej. In August, he suffered a setback on the professional front when his Nakshatram bombed at the box office while getting mixed reviews from fans. Directed by Krishna Vamsi, it also featured Sundeep Kishan in the lead and received a mixed response from critics. Just a few months later, he bounced back in style with Jawaan. An action-drama, it also had Mehreen Kaur Pirzada in a key role and did decent business at the box office. While speaking about the film, he had said that shooting for it was a challenging experience for her. “We shot in real places near Charminar and Dhoolpet. It was challenging but proactive planning came very handy. On the previous night of the shoot day, we’d go to the place and have everything set up. Next morning, we’d shoot in jet speed and quickly shift from that place,” she had told a leading news agency. With 2017 in the past, SDT is currently gearing up for the release of Intelligent. A VV Vinayak directorial, it is slated to hit screens this week and has created a buzz amongst fans courtesy its intriguing poster. The film’s pre-release was held yesterday and it proved to be a memorable affair. SDT and his lovely co-star Lavanya graced the function. And, not surprisingly, they grabbed plenty of attention. While SDT sported a cool casual look, the Soggade Chinni Nayana star went in for a simple yet smart getup. Interestingly, Lavanya is not going through a very good phase on the work front. Arguably her biggest release of 2017 was the action-thriller Yuddham Sharanam. Featuring her as the female lead opposite Naga Chaitanya, it did not do well at the box office and failed to win critical acclaim. As such, Intelligent will be a crucial release for her.